It’s black to move. Is this a win, loss, or draw? This endgame comes to us from a Ruy Lopez. If I were to teach a student only one position from any game I’ve ever played, this would be the one. There it was in front of me and I knew that it was special. I solved the puzzle without knowing how I derived the answer. The process started me thinking about how I approach chess positions. Naturally you must catalog your mental errors before you can stop making them, This is “My System” of thinking, warts and all. Be mindful that no system is universally applicable and that the thinking process is not necessarily linear. Finding whether a move is forced or not (Step One) may require positional consideration. Dart back and forth between stages and add your own. 1. Forcing Moves? If I must make a particular move then I ought to start my analysis only afterwards. Black must move the knight. Three moves result in capture. Both moves to the second file allow white’s passer permanent king protection. So we’d like a check, but after 1…Ke7 the knight is doomed. What to do!? I’m stuck between actively degrading my position and losing a piece. I can’t fathom moving anything but the knight either. 2. Where does my piece belong? We must take into account the piece’s ideal placement as well as the feasibility of the maneuver. 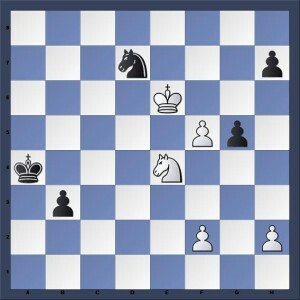 Here the black knight can use its peculiar geometry to either harass white’s king and pawn or assist in the black’s pawn’s promotion. The second choice can be eliminated due to time constraints. Once the knight leaves the premises, white will queen. A piece can belong nowhere too, and this is the case here. Black’s knight cannot stop white’s queening attempt because of the b-pawn. Were that pawn not there, white could insist upon the sacrifice indefinitely. The knight can buy time by sitting on the queening square however. Part of your material inventory involves seeing when a piece is no longer materially valuable. Maybe it can proffer some other resource. I love Pal Benko’s endgame manual, but if the winter gets cold enough it’s of greater worth inside my fireplace. The king is also firmly moored to its side as well. Relative immobility of the pieces means tactics will predominate. 3. What does my opponent want to do? What are the consequences of his plans? Are they local (affecting one part of the board) or global (affecting the whole board)? Seizure of a square usually affects a region but promoting a pawn affects everything for instance. 4. I break the board down into sections. There are often, as here, two, or even three, separate chess games within a position. Even with long-range pieces the balance of power in a sector changes slowly. Can the pieces in one sector stymie my opponent’s plan? Are my pieces able to achieve the strategic aim in a given sector? If I lose the “battle” on the queen wing do I have adequate resources on the king wing? Clearly I do not. If I cannot stop my opponent’s plans I must ruthlessly pursue my own. 4. I decide what a winning situation looks like in my area of activity. How do I know I’ve been successful? What must happen? What cannot happen? My success might involve marooning white’s knight on b1. Black’s king can give chase and the beleaguered knight can neither give itself up or stray too far. A draw by repetition will follow. Another try is using the king to bar the knight’s entry into key squares. Is this possible? I fail if I cannot oust the knight in time. How can I lose time? If the white knight and black pawn make me lose tempo. 5. I decide on the move sequence. Which path should the king take? Referencing step number four we can see that Ka3 unnecessarily blocks black’s king. B2 and Kb4 are interchangeable because white will take the knight. Thus one route lacks independent value and I need not analyze it. I hope you’ve enjoyed this brain-inspired bric-a-brac and that it improves your chess! This entry was posted in Chess Endings, Chess Puzzles by . Bookmark the permalink.